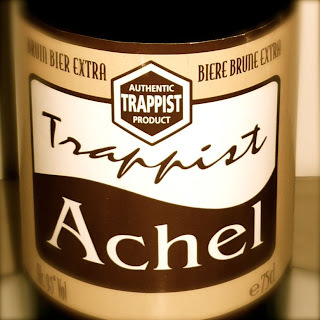 Having recently tasted the pleasures of Achel Brune, and wondering how I will fit it into my list of top ten Belgian beers, I was very excited to find a 75cl bottle of Achel Brune Extra in a shop downtown yesterday. The “extra” is more than the 9.5% alcohol, above the 8% of regular Achel Brune. It really is an incredible improvement of an already almost ideal beer. We passed around the bottle, and everyone agreed: this is one of the best beers any one of us has ever tried. It’s creamy, malt loaf, with the cinnamon and vanilla of regular Achel Brune, but add to that Toblerone, Crunchy bar, toffee, coffee -- all wrapped up in a light non-fizzy foam. Fiona called it, “a soft puffy cloud”. Bob said it was, “the smoothest beer I’ve ever tasted”. The alcohol, though relatively high, is so mixed in with the complexity, that it hardly makes a noticeable appearance. Bob said, “this is 9.5%, but you don’t taste it at all”. I believe, and I know this will be controversial, that Achel Brune Extra is at least as good as Westvleteren 8. Maybe even Westvleteren 12. Could this be the new king of dark Trappist beers? I will have to do a side-by-side taste test when I get some Westvleteren 12, which could be soon since we seem to have a new lead on the beer phone. So, certainly Achel Brune and Achel Brune Extra deserve to be in my list of top ten Belgian beers, and I will have to demote at least one of the beers currently there. After much consideration, I think the Westmalle Dubbel will be bumped down. Sorry, but Achel Brune Extra beats it by quite a bit.